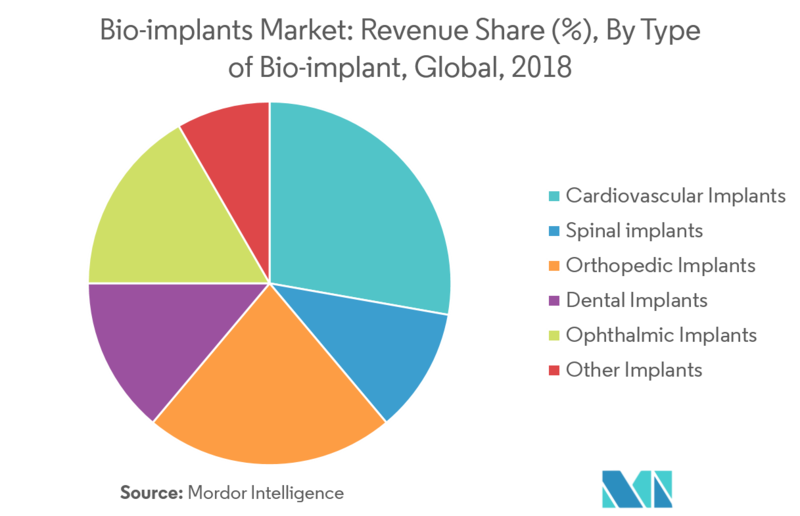 The major factors for the growth of the bio-implants market include the rise in the geriatric population, increasing incidence of chronic diseases and lifestyle disorders, and rising preference toward minimally invasive surgeries. The bio-implants market is primarily driven by the rising incidences of chronic diseases and lifestyle-related disorders. Bio-implants help in better management and specific drug delivery in conditions, such as obesity, infections, and musculoskeletal disorders. For instance, bio-implants provide a unique and specific drug delivery for the skeletal system. In the case of chronic osteomyelitis and deep soft-tissue infections, beads and spacers with high antibiotic concentrations are used for treatment, as they help in eliminating systemic side effects. According to the American Heart Association (AHA), cardiovascular diseases account for 17.3 million deaths per year. The Centre for Disease Control and Prevention states that heart diseases account for 610,000 deaths per year in the United States. Coronary heart disease (CHD) is the most common type, with a death toll of over 370,000 patients, annually. In the European region, cardiovascular disease (CVD) causes more than half of the total deaths. In Europe, CVD causes 46 times the number of deaths and 11 times the disease burden caused by AIDS, tuberculosis, and malaria combined. Cardiac implants are used in related cardiac surgeries, and thus, the increasing incidences of cardiac diseases is expected to drive the demand for cardiac implants. Hence, the market studied is expected to witness steady growth over the forecast period, primarily due to the rising incidences of chronic diseases and lifestyle disorders. A bio-implant is a prosthesis that is used to normalize physiological functions. It is made of biosynthetic materials, like collagen, and tissue-engineered products, like artificial skin and tissues. Some of the bioimplants are made up of polymers or biopolymers as well. 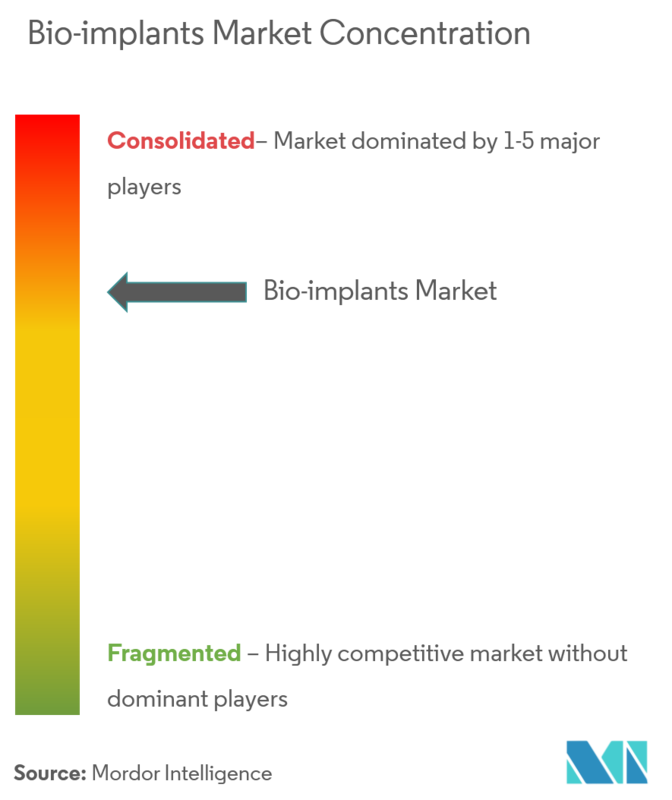 The market is segmented by type of bio-implants, origin, and geography. The major factor driving the growth of the market is the rising prevalence of cardiovascular diseases across the world. Moreover, there is an evident rise in geriatric population, globally, which is expected to create more opportunities for the market over the forecast period. As per the data published by the Pennsylvania Health Care Cost Containment Council, congenital heart defect affects nearly one out of every 100 infants in the United States or about 40,000 children per year. Furthermore, according to the estimates of the American Heart Association, in 2018, cardiovascular diseases accounted for nearly 836,546 deaths in the United States, which is about 1 of every three deaths in the country. Also, some of the significant risk factors, such as smoking and high blood pressure, are increasing in the United States owing to the sedentary lifestyle of the population. Most of the patients opt for heart surgery, and bioimplants can be used to treat various cardiovascular diseases. Thus, owing to all the above-mentioned factors, the market is expected to witness high growth over the forecast period. 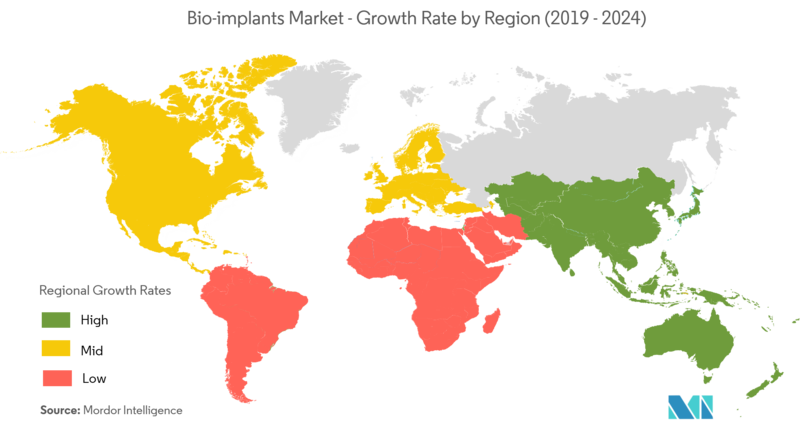 North America is found to hold a major share for the bio-implants market and is expected to show a similar trend over the forecast period, without significant fluctuations. The major factors driving the growth of the market are an increasing prevalence of chronic diseases and the presence of better healthcare infrastructure. According to the American Chiropractic Association, 2017, about 65 million Americans are suffering from lower back problems every year, and approximately 8 out of every 10 Americans are expected to suffer from back pain at some point in their life. In addition, there is a rising number of cases of ophthalmic diseases in the United States. For instance, according to the National Eye Institute, about 7.7 million diabetic retinopathy cases and 24 million cataract cases were recorded in the country. This number is expected to reach 11.3 million and 38 million, respectively, by 2030. 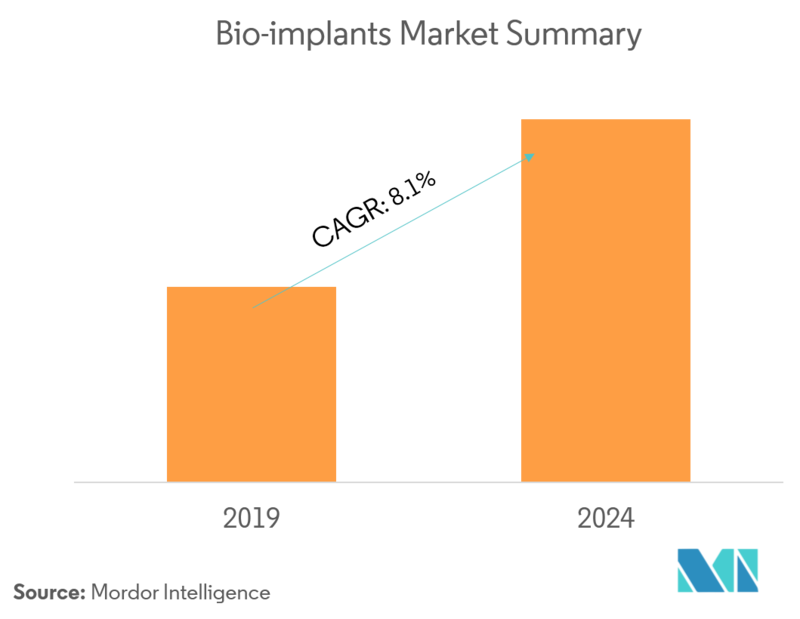 The rising number of cases of chronic diseases is expected to increase the overall demand for the bio-implants market. Thus, owing to the all above mentioned factors the market is expected to witness high growth rate over the forecast period. The market studied is consolidated, owing to the presence of a few key players. The major market players are focusing on technological advancement in order to acquire maximum market share. 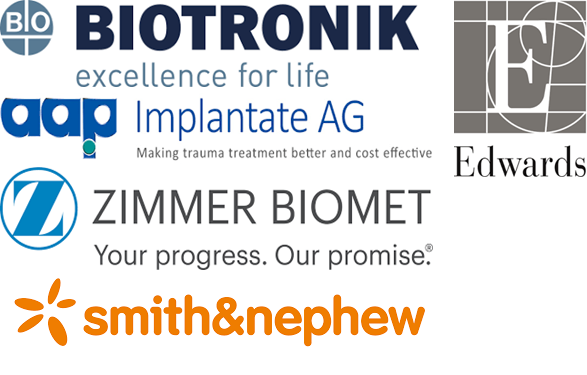 Some of the market players are aap Implantate AG, Abbott, Bausch & Lomb Incorporated, BIOTRONIK, Inc., Edwards Lifesciences Corporation, LifeNet Health, MiMedx, Smith & Nephew Plc, and Zimmer Biomet.